We're excited to announce our new Heating Oil Additive giveaway! To enter simply Like our Facebook or Twitter Page, Like our Heating Oil Giveaway Post and Comment the name of someone you know who uses Heating Oil! We'll announce a winner each week by commenting on the post, stay tuned to our social media accounts to check if you've won! Winners will be selected using a 3rd party random selection system. Winners will be announced weekly from Friday 15th March 2019 until Friday 17th May. This will be announced as a comment on the social media post and also be updated in the winners section above. Entrants must tag at least 1 person to enter but are welcome to tag more people - this will not increase your volume of entries or likelihood of winning. Competitions are open to UK residents. Prizes will be posted within 2 weeks of the winners' information being provided to HomeFuels Direct. HomeFuels Direct reserves the right to use winners' names in marketing materials. Prizes may not be exchanged for cash or any other alternative. We're always working hard to find ways to help you save money! 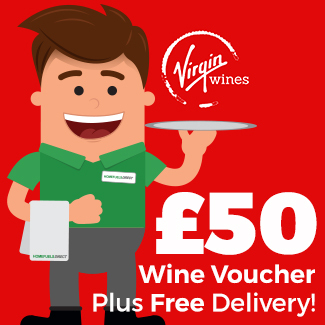 That's why we've partnered with Virgin Wines to offer you an incredible £50 Virgin Wines voucher! Simply check your order confirmation email to find your voucher! Leave a review & receive a free bottle of additive! Simply mention your initials and your order date in your review and we'll do the rest! The free additive offer applies only to customers who have ordered with HomeFuels Direct. The free additive offer applies to all reviews, positive or negative. We're giving away 500 Litres of Heating Oil! To Enter Simply Order Heating Oil Between 30th November & Midnight December 28th 2018. HomeFuels Direct 500 Litre Giveaway! We're pleased to announce the winner of our 500 Litre Giveaway! To find out whether you've won simply watch the video on our Facebook page! 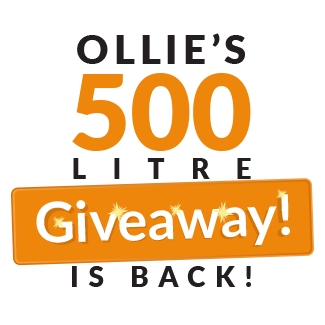 Christmas is coming and this year Ollie is giving you the chance to win 500 Litres of Free Heating Oil to heat your home! Simply order heating oil between now and the 31st of December to enter the competition. Heating oil prices are rising as we move into winter, but HomeFuels Direct are here to help! We'd like to help you save even more money on your heating oil order. 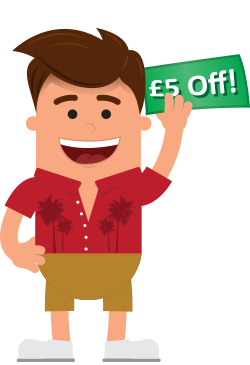 Simply add the code "5OFF" in the checkout to receive £5 off any order over 500 litres. But hurry! This offer only lasts until midnight on Sunday the 1st of October 2017! Want to know about our latest offers? Keep an eye on this page or our Facebook & Twitter pages to get the best deals! Come Home To A Warm House! Make sure that after your well deserved Summer holiday away, you come back to a well stocked tank and a nice warm house. Our offer runs out on Sunday the 23rd of July 2018 - to get this deal simply add the coupon code in the checkout. HomeFuels Direct's Big Birthday Giveaway! We're extremely excited to be celebrating our 9th year of business on the 1st of July! For that reason we've decided to share some of our joy with you! 9th Birthday Offer - £9 Off! Over this weekend when you order 1000 litres or more you’ll be eligible. To get your gift simply enter the code "9BDAY" at the checkout before midnight on Sunday and you'll automatically receive the discount! 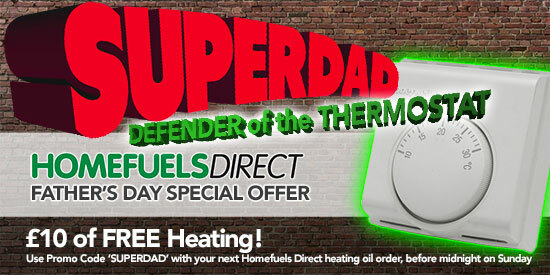 To keep up to date with all our offers and deals like and follow HomeFuels Direct on Facebook & Twitter. 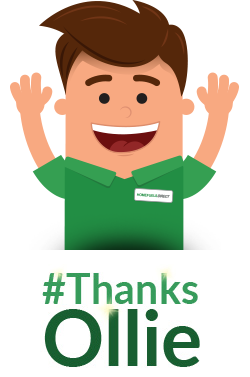 Receive £10 of FREE heating this Father's Day! Homefuels Direct would like to wish everyone a Happy Father's Day by offering a £10 discount on any order placed this Sunday. Simply enter the code 'SUPERDAD' at the checkout to receive your £10 discount. AgaMax – New & Improved Formula! 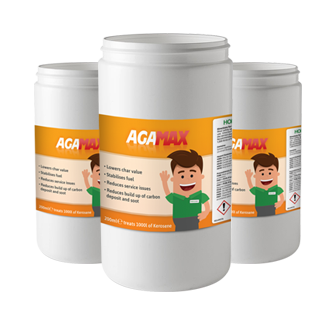 Extend the life of your Aga or Range cooker with our specially formulated heating oil additive. 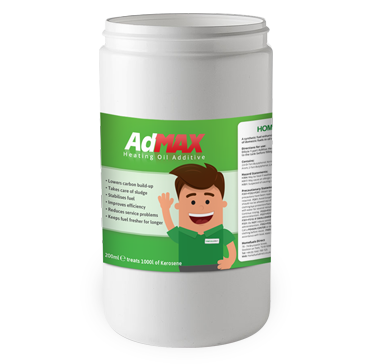 Our additives have been proven to increase the efficiency of home heating oil systems and prolong their lifespan! Our specialist cooker additive reduces soot built up and lowers sludge build up. It couldn’t be easier to use, simply add the 200ml bottle to your oil tank before delivery and in no time the additive will take effect.